Does your child love construction toys and does it like to be active creatively? Then this Basic Set 90 pieces from Clicformers will become a real hit! Clicformers is an irresistible fun toy for children from 4 to 12 years old. This building toy stimulates their imagination and promotes eye-hand coordination. It is a toy for children which is also suitable for toddlers. Where older children like to build nice characters, the smallest children discover basic shapes and colors that they can click together. Clicformers simply grow with the development of your child and remain attractive regardless of the age of the child. Therefore they’ve been developped to be sustainable educational toys, because something you will enjoy for years must also last for many years. Children are fond of the endless building possibilities and the cheerful colors of Clicformers. With this box of Clicformers there is definitely no lack of possibilities. You can find as much as 64 Clicformers blocks in it, along with 26 accessories, a sticker sheet and a booklet full of inspiration and building plans. What can you build with the building blocks in this box? Nearly everything you can imagine. Feel free to let your imagination run wild. With Clicformers you can build a rocket, a duck or a crown with precious stones. The accessories and stickers included in the box are the finishing touch of the constructions! With Clicformers your creations look really exquisite. And because all Clicformers parts of the different boxes can be combined, you can continue to expand your Clicformers universe. Tired of being a king or a princess? Disassemble your crown and make a new creation. In conclusion, with Clicformers you will never be bored! The fact of getting smarter while playing is already a bonus! Really, Clicformers are the nicest educational toys! At first sight, Clicformers look very similar to Clics. There are indeed a lot of similarities. What’s most important is that Clicformers is a fun, educational construction toy, like Clics. Yet, you can’t combine both building blocks, because Clicformers are not Clics. 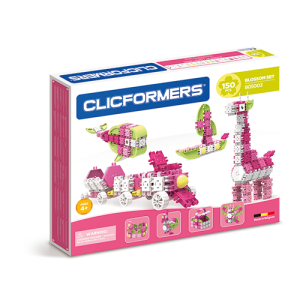 With Clicformers, you still build in the same way, namely by clicking the blocks, but Clicformers are capable of doing more, because of the new concept.